Climate scientists have warned that just 2oC of global warming is enough to pass the “point of no return”. This calls for radical changes that we need to undertake to reduce and adapt to climate change. The way forward in achieving this is to design human-centred solutions in collaboration with local communities. Sameera Chukkapalli, Director of Needlab explored how design can make lives better, through examples of empowered communities The jumpthegap®(talk) took place at Roca Madrid Gallery within the framework of the eighth edition of the International Design Contest jumpthegap®. 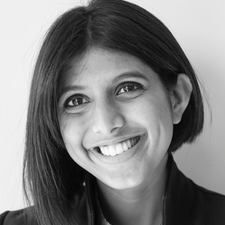 Sameera is an advanced architect and director of Needlab, Barcelona, Spain. She spends most of her time drafting human-centered design solutions with communities, around the world. She has conducted workshops and built structures in over 10 countries with impact reach of more than 2050 people. Currently, she is driven towards solving the UN Sustainable development Goals and making sustainable design solutions reachable to all.